Though strings of Christmas lights got a pass in the EISA legislation, LEDs have already captured 20% of that market, far above their penetration in general lighting. LED holiday lights have been sold in the US since at least 2007. Early on, most were red, blue, or other colors; white was still problematical, tending toward the cool and the blue. Today, strings of 50 lights in warm white are easy to come by, and cost only a small premium over incandescents. 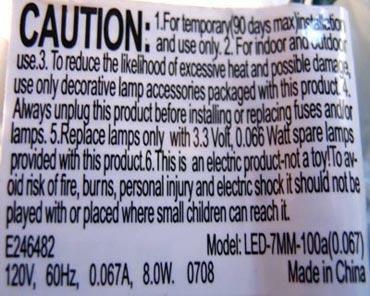 Certainly the majority, perhaps the preponderance, of holiday lights available here are made in China. Here's one data point: A friend bought a string of multicolor LED lights from Lowe's four years ago. They were GE-branded. Figures 1 and 2 show a label and detail from one side of the plug, displaying a model number, YL-L2K-24B. Feeding that number into Google and clicking on the first hit (the others look unrelated) returns an error, but the cached result from that search (Figure 3) indicates that the source of the GE product was a Taiwanese factory. The Kansas City Star reported that this year, Walmart is devoting one-half of its holiday light shelf space to LEDs, and that Costco is selling no incandescent strings at all this year. The head of engineering and technology for the American Lighting Association noted at a trade show earlier this year that essentially all the holiday lights being presented to retailers were LEDs. The reason why the tide has turned on holiday LEDs is easy to see. Their price is in the vicinity of that for incandescents, or in some cases even lower. Google Shopping turns up these prices now online: for a no-name string of 50 warm white lights, $15. For multicolor lights apparently from the same source, $13. For a string of incandescents, $8.98. Another friend bought two strings of warm white LEDs at Costco last year for between $8.00 and $10.00 per string. Strings of incandescents were $15.00 at that time, he reported. Since at least 2008, HolidayLEDs.com has run a Christmas light recycling program -- here is this year's. People can send in old strings of incandescents, functional or not, and receive a discount on equivalent LEDs. HolidayLEDs.com separates and recycles the old strings. This year, Home Depot offered a similar turn-in program at its stores nationwide (it ended on November 17). Sales of LED lights were up 50% last year at a Kansas light bulb store, KansasCity.com reported, and the prognosis for this year is more of the same. Penetration of holiday LEDs is in the low double digits, compared to perhaps 1% for general LED lighting in the residential market, and a few percent commercially. Within a very few years, incandescent holiday lights, first demonstrated by Thomas Edison himself in 1880, may have gone the way of the dodo.